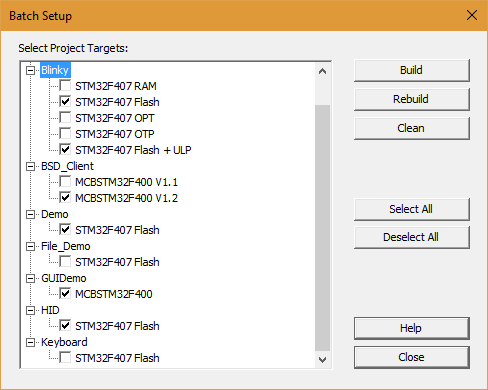 The Batch Setup dialog provides a convenient way to build specific project targets in one working step. This dialog is available for single and multi-projects. The toolbar button builds the current project or multi-project based on the current Batch Setup parameters. Expanding the drop-down list allows one-click Batch Build, Batch Rebuild, Batch Clean or access to the Batch Setup dialog. compiles and assembles the files that have changed and builds the object files. compiles and assembles all files and builds the object files. deletes the object files for the selected project targets as described in the Notes of Project Menu and Commands. opens the Batch Setup dialog. The menu selection Project - Batch Setup.. also opens this dialog. lists the projects in alphabetical order. Project targets are listed in the order defined in the particular project. Actions associated with the buttons apply only to the selected targets in this list. executes a Batch Build as defined above. enables all targets listed in the field Select Project Targets. disables all targets listed in the field Select Project Targets. Object files are created according to the settings of the individual project. No in-common object file is created in addition. 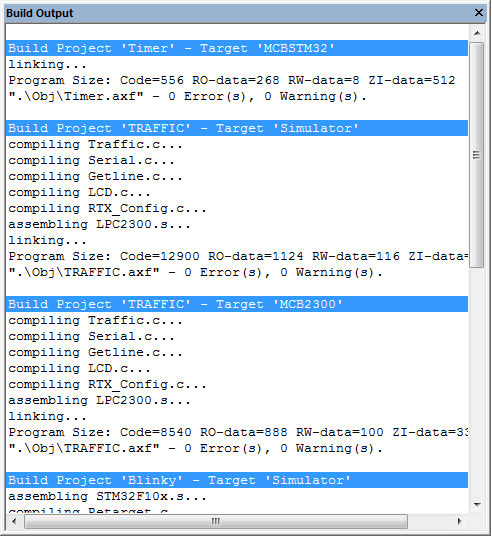 Targets are build in the order established in the window Project.